From Neil Abramson, the acclaimed author of Unsaid, comes a riveting novel that explores the complex connection between humans and animals. Veterinarian Samantha Lewis and her team are dedicated to providing a sanctuary for unwanted, abused, and abandoned dogs in New York City. But every day it gets harder to operate her no-kill shelter. Sam is already at her breaking point when she learns of an unidentified, dangerous virus spreading through their neighborhood. The medical community can only determine that animals are the carriers. Amid growing panic and a demand for immediate answers, suspicion abruptly falls on dogs as the source. Soon the governor is calling in the National Guard to enforce a quarantine -- no dog may leave the area. Samantha knows from her own painful history that, despite the lack of real evidence against the dogs, a quarantine may only be the beginning. As questions about the source of the virus mount and clash with the pressure for a politically expedient resolution, Sam is forced to make life-altering choices. She finds allies in a motley crew of New Yorkers -- a local priest, a troubled teen, a smart-mouthed former psychologist, and a cop desperate to do the right thing -- all looking for sanctuary from their own personal demons. But the person Sam needs the most to unravel the mystery of the virus and save the dogs is the last one she'd ever want to call on -- because contacting him will mean confronting the traumatic past she has fought so hard to escape. Whew, this book is heavy. I mean, it's got the whole animal euthanasia plotline about Sam's attempts to protect New York's dog population during the outbreak, but it also has a lot of poignant discussions about animal abuse, the use of animals in medical testing, human abuse (including one memory of a sexual assault and another of the discovery of a gruesome murder), substance abuse, and more. The main characters each carry their own heavy, terrible baggage and they must learn to cope with it throughout the course of the book in order to do their best for the dogs who are being pinned (with little to no evidence) for the spread of a dangerous new virus that is affecting and killing children. Honestly, I didn't really like the book that much. It was a little too gritty, too painful, and too explicit. The language was really bad and the description of violence was too extreme for my tastes. Also, the descriptions of animal cruelty and of the euthanasia process were way too much for this animal lover. It's absolutely heartbreaking to read about how the innocent, loving creatures who are put down because no one will love them back! Setting aside the strong language and my emotional reaction to the violence, Just Life is definitely a very thought-provoking read that makes a good jumping-off point for interesting debates. The characters are diverse and pretty well-rounded, and Sam is even pretty likeable (though her sort-of romance plotline feels really forced). If you're a little less sensitive than I am, you might like this book much more than I did. As it is, I'm handing off my copy to the Little Free Library by my house and making sure to give my dog lots of extra pats. It's been a roller-coaster month as my sweet old boxer has been slowly losing control over her hind legs, and I really don't need any sad books about dying dogs lying around while watching her deteriorate. Come to think of it, my dog's health problems may also have affected my reaction to the book; if so, I'm sorry I can't give a more unbiased review. 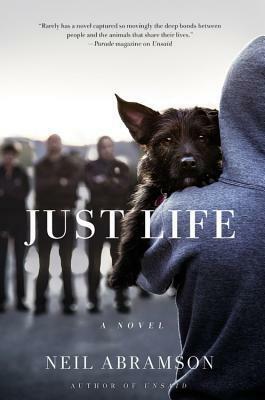 If anyone else has read Just Life, please let me know in the comments what you thought of it! Disclaimer: I received a complimentary copy of this book to participate in a TLC book tour.